If you’re a normal Westporter, you’re probably all meeting-ed out. So I’m presenting this without editorial comment. For more information the Westport Main to Train Study, click here. Post Road East and Riverside Avenue. 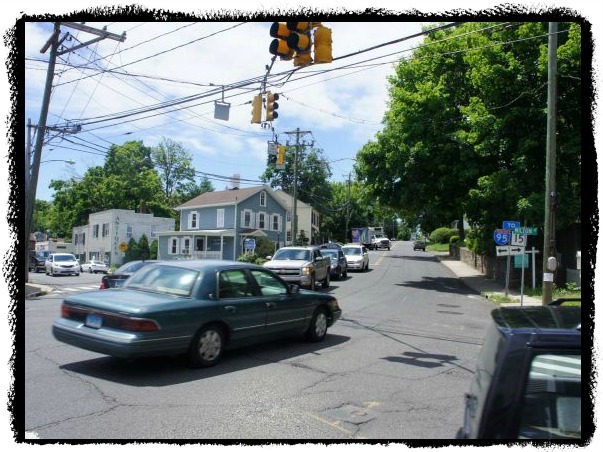 The “Main to Train” study includes the often-gridlocked intersection. This entry was posted in Downtown, Local politics, Saugatuck, Transportation and tagged "Main to Train" study, Post Road East, Riverside Avenue. Bookmark the permalink. Speak up if you want to see parking on Riverside Avenue remain in front of places like Saugatuck El and Assumption Church. As I am not sure how you do a bike lane down Riverside and still allow parking on the street. Yet another silly, grant funded, make-work “study” destined for a shelf somewhere in town hall. Since we just returned from the Netherlands – which is right up there with Denmark on bicycle utilization – I’d be surprised if anything significant comes of this study. The US has such a huge way to go to create the infrastructure the Dutch have – even small towns like our daughters have more bike lanes – along any main road plus on many side roads as well – and the roads themselves are designed with frequent drempels and other traffic calming solutions like rotaries, etc – plus there is very regular bus service, trains cross-crossing the country with hourly or half hourly service, etc. America can only dream of such convenience and bike or pedestrian-friendly thinking. Good luck to all in this study – I may be a pessimist but also a realist – too much investment in cars here for too many years with zero focus in most states for alternatives.